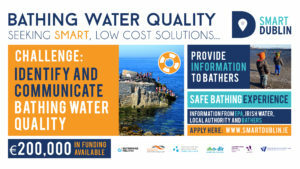 Dun Laoghaire Rathdown County Council and Waterford City and County Council seek low cost, innovative, technological solutions in the form of products, services, or applications to address timely identification and communication of bathing water quality. A successful outcome would result in key information being made available to bathers to allow them to make an informed decision as to whether or not they should swim in that particular area. The challenge is open for application until the 13th of July at 12 pm (noon). There was a briefing session for all prospective applicants in Dublin on the 30th of May. It provided the opportunity to discuss the requirements of the brief with Smart Dublin, Waterford City and County Council and Enterprise Ireland. See the presentations below. Enterprise Ireland’s Small Business Innovation Research (SBIR) initiative aims to create partnerships between SMEs and public bodies to develop innovative solutions to public needs through competitive challenges. These challenges are co-funded by Enterprise Ireland and the relevant public-sector body. Since the first challenges were launched in 2016, the initiative has been gaining traction – 10 challenges are currently running across contracting authorities nationally, with 11 new challenges launching in 2018. See for further information.